The amount of information online and in print about where to eat in Paris, the most visited city in the world, is absolutely dizzying. As much as I enjoy researching where to find the choicest morsels (it’s one of my favorite sports), I get overwhelmed and unfocused when there’s too much information to process. In situations like these, there’s nothing I appreciate more than a like-minded food lover telling me exactly where to eat. Thanks to my friends Steve, Stephane, and Roy, and the book Hungry for Paris by Alexander Lobrano, planning my Paris eating itinerary came together without fuss or flops. 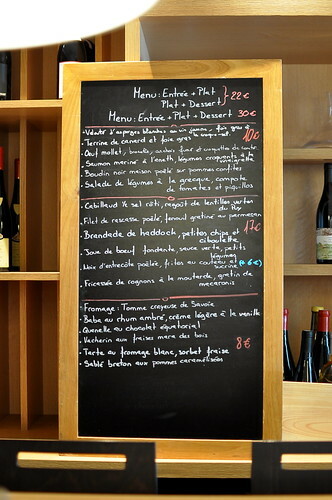 It is my hope that these write-ups will save fellow travelers the headache of planning out the perfect Parisian meals. The Astronomer, my mom, and I met up with The Astronomer’s great aunt and Paris resident Paulette for lunch at Le Beurre Noisette on our first full day in Paris. This lovely bistro, whose name literally means “hazelnut butter” or “brown butter,” came highly recommended by Stephane. I’ve yet to encounter a more delicious name for a restaurant in all my years of eating. 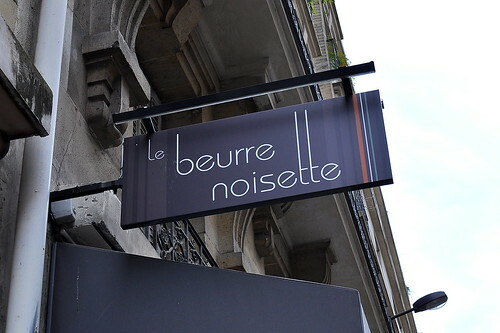 Chef Thierry Blanqui opened Le Beurre Noisette in 2001 after honing his culinary skills and style at some of the city’s best restaurants including The Ritz, La Tour d’Argent, and Le Doyen. Here in the 15th arrondissement, Chef serves up delightful plates inspired by the season’s bounty at beyond reasonable prices. The day’s menu was scrawled on a portable slate board that was brought to our table at the start of the meal and removed as soon as we placed our order. 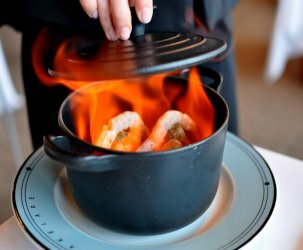 Two set menu options were available including a starter and a main course for €22 or a starter, main course, and dessert for €30. Anticipating a packed eating itinerary in the days to follow, we felt that three dishes per person might be a bit much and decided to order a la carte. It would be one of the few instances on the trip that we turned down the considerable bargain offered by the set menus. 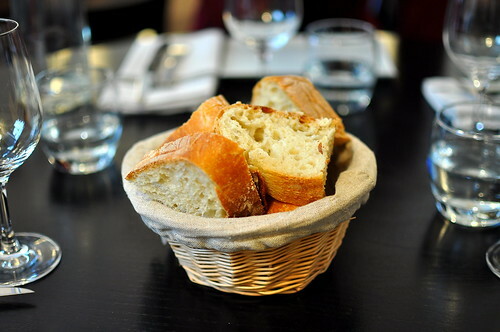 The French table isn’t complete without a basket of extraordinary bread. Our party of four chose four starters to share. The boudin noir maison poele sur pommes confites, house-made blood sausage served with an apple compote and a paper-thin slice of ham, was thoughtfully composed. The sweetness from the apples and the saltiness of the ham perked up the iron-rich sausage beautifully. 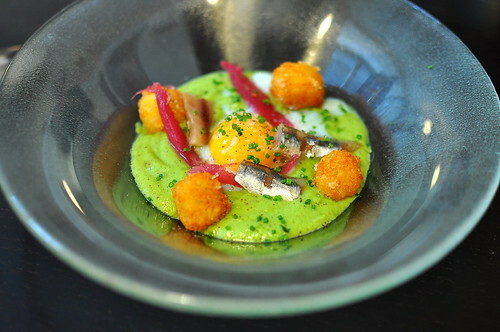 The oeuf mollet, brocolis, anchois fume et croquettes de comte, soft cooked egg with broccoli, smoked anchovies, and comte croquettes, was irresistible to the eyes and mouth. The bite-sized croquettes, lightly sprinkled with salt, were everyone’s favorite element. 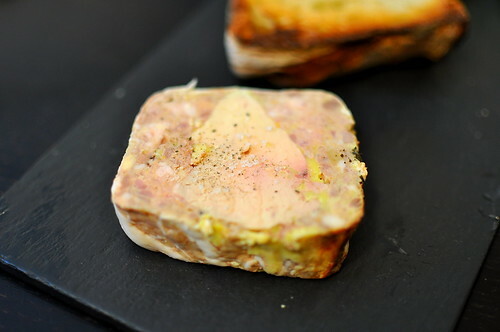 One of my favorite foie gras preparations of the trip was this terrine de carnard et foie gras, which was comprised of foie gras framed by duck pate. 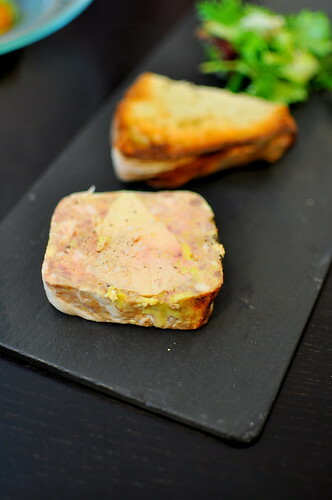 The foie gras brought a certain unctuousness like only it can, while the pate had depth and heft. Together they tickled our taste buds. While we chose the salade de legumes a la qreque, compote de tomates et piquillos out of interest for our health, it turned out to be memorable for more than its nutritional content. From the tomatoes to the peppers to the hearts of palm, every piece of the puzzle was dazzlingly fresh and sweet. The slices of ham on top were an added bonus. 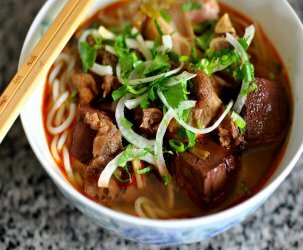 Following the four starters, we rounded out our meal with two main courses. 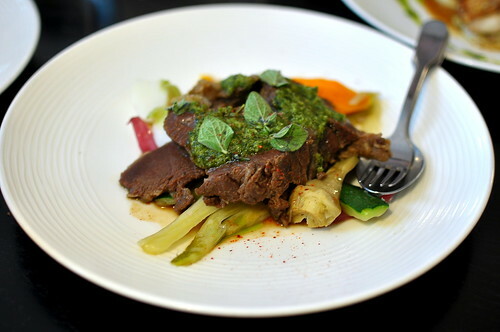 The joue de boeuf fondante, sauce verte, petis legumes, beef cheeks with vegetables and herb sauce, was really dynamite. 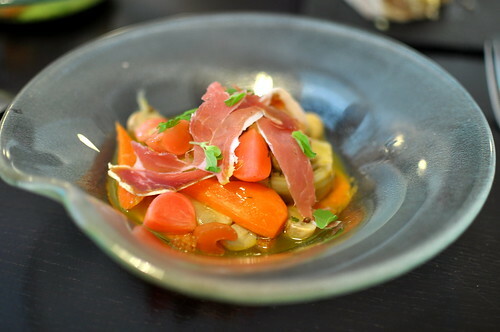 The beef could not have been tenderer, while the artichokes, zucchini, and carrots were each perfectly cooked. 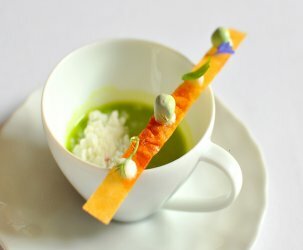 It wasn’t a mind-blowing dish, just an impeccably executed one. Both The Astronomer and Paulette adore fennel, so the fillet de rascasse poele fenouil gratine au parmesan was an absolute must. 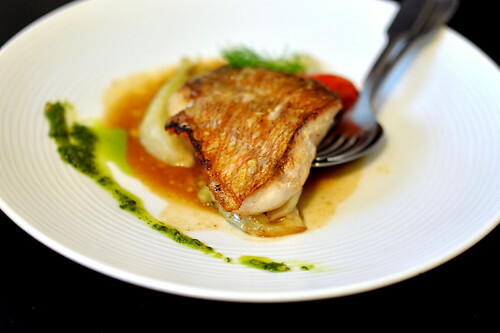 The fish’s crispy skin, dabbed in a bit of the pesto, was the highlight of the plate. 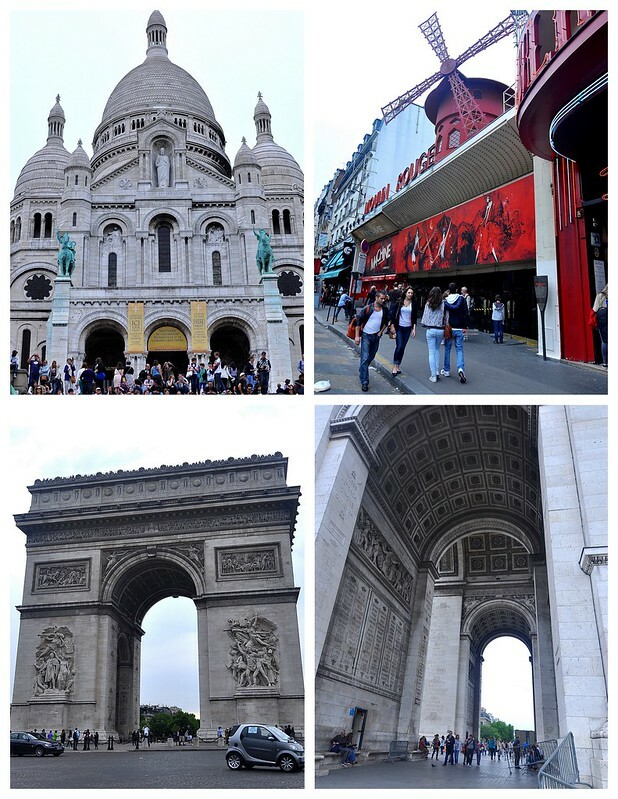 Following Le Beurre Noisette, we pranced around the city scoping out its most famous sites (clockwise from top left): La Basilique du Sacré Coeur de Montmartre, Moulin Rouge, and Arc de Triomphe. 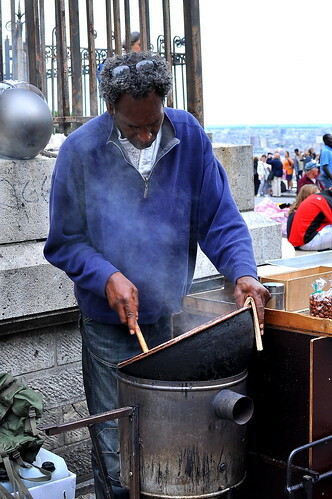 While atop Montmartre, we smelled something stickily sweet in the air and found a gentlemen making fresh pralines. We bought a “grand” sized bag and snacked on candied nuts while strolling through the church. It sort of made up for not ordering dessert at lunch. You’ve got friends in high places. Glad they steered you right. I’m living vicariously through your Paris adventures! 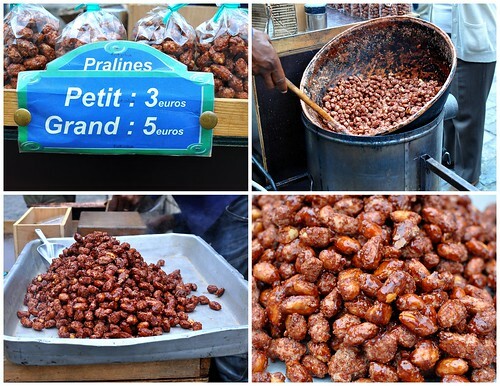 (And craving boudin noir right now…) Will have to keep your recommendations in mind if I end up traveling there next year! 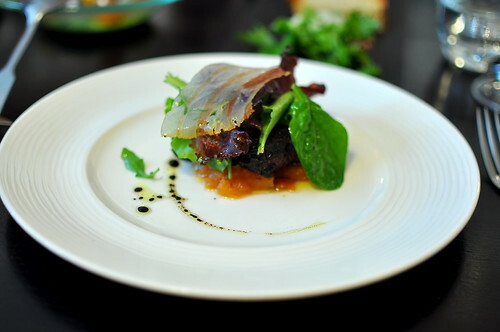 The plate of beef cheeks and fish look so comforting! The comte croquettes don’t look bad either. If only bars could serve baskets of comte croquettes… Wowzas! Such beautiful plates of food, those nuts sound wonderful too!